Plex is one of the most powerful home theater servers available. It allows you to stream your own music, movies, and TV shows, so it’s great for cord-cutters. Plex’s third-party channels add even more options. And now, Plex is even more powerful. Plex recently announced support for live streaming TV through OTA antennas and compatible digital tuners. Plex Live TV & DVR is one of the newer Plex features. To use it, you need a Plex Pass subscription. Plex Pass subscriptions can be purchased for $4.99/month or $39.99/year. There’s also a one-time “Lifetime” membership fee of $119.99. While Plex Pass does have some good features, it is pricey. Related: Plex Pass Review – Is it Worth the Money? If you don’t want to invest in a Plex Pass, scroll down to learn about Plex channels. Plex channels give you a way to watch live web TV through Plex. A supported DVR tuner and OTA antenna – A list of supported devices can be found here. An updated Plex media server – Make sure you’re running the latest version of Plex. Now that you know what you need, let’s dive into the setup steps. Here are the basic steps for adding Plex DVR & Live TV to your Plex media center. Unbox your OTA antenna and connect it to your digital TV tuner. Connect your TV tuner to Plex Media Server. On your Plex Media Server, open up the main menu and click Settings. Click Server on the upper-right corner of the settings menu. Select DVR settings on the bottom-left part of the settings menu and press Create A DVR. Source: YouTube. The DVR settings menu. Plex will automatically detect any connected, compatible digital TV tuners. Select your tuner and proceed to step 7. Source: YouTube. Select your DVR from this menu. Enter your country, preferred language and ZIP code. Source: YouTube. Enter your information here. Your Plex media server will begin scanning for channels. Source: YouTube. Your Plex server will begin channel scanning. When channel scanning is complete, choose the channels that you want to either watch live or record in the future. Source: YouTube. Select your preferred channels here. Press Save. Plex will then add the channels to your Electronic Program Guide. Source: YouTube. Your Plex server will scan and add your selected channels. Source: YouTube. The Plex Program Guide. Next, simply select the show you’d like to watch. You can Watch it immediately, Record it for future viewing or Go To Show to learn more about the show and the episode. That’s it! You’re all set up. Next, let’s discuss some of the best features of Plex Live TV & DVR and find out whether or not it’s worth the price of entry. 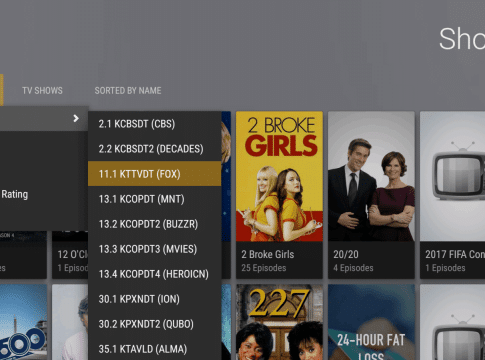 If you’re a dedicated cord-cutter, Plex Live TV & DVR streaming has some benefits you may find appealing. With just a digital tuner, OTA antenna and subscription to Plex you can enjoy programming from local broadcast stations. This includes local news and sports programming, which is often hard to find via the web. If you have your Plex media server configured to accept remote connections, you can watch both live and recorded TV on Android and iOS devices. Movies and TV shows that are recorded through the Plex DVR are automatically tagged with metadata and organized alongside the rest of your media in Plex. If you’re a Plex power-user with a large library of your own media, this is a great feature. New platforms are added all the time, so make sure to check out this page from Plex for more information. Is Plex Live TV & DVR worth it? If you simply want to watch live TV, you may find it easier and cheaper to skip Plex Pass and just set up a digital tuner and OTA antenna on your television. But if you want to record shows for later, Plex Pass may be worth the investment. If you don’t want Plex Pass, read on to find out how to watch internet video via Plex Channels. Plex channels are video plug-ins that allow you to pull live TV from the web into Plex. There are hundreds of channels available on the official Plex Store. These applications have been thoroughly vetted by Plex for legality and legitimacy and offer an easy way to enjoy a wide variety of free, streaming digital content. Source: Flixed. A selection of Plex channels, both official and unofficial. Now that you understand the basics of Plex channels, let’s get into the details and discuss the channel installation process. This is the easiest way to install Plex channels. Channels on the official Plex channel browser have been vetted for legitimacy and quality and you can install them directly from the Plex client. Here’s how to install a channel using the official Plex channel browser. Open Plex media server and select Channels from the left-hand menu. Source: Flixed. The “channels” menu in Plex. Source: Flixed. The “Install” menu option is visible in the top right. You can browse Plex channels based on popularity, what’s new, recently added and more via the Channel Directory. Source: Flixed. The channel browser in Plex. Select the channel of your choice. A pop-up will appear. Select Install to begin installing your selected channel. Source: Flixed. The “Install” popup in Plex. Navigate back to Home and select Channels again. Your installed channel will now be present in your media server. Source: Flixed. The freshly-installed Plex channel is visible. There are dozens of Plex channels available from networks like CBS, FOX, NBC, CNN, VICE and more. All of these channels can be quickly installed from the main Plex channel browser, so give them all a try! To get you started, we’ve compiled our top 5 picks below. The BBC iPlayer is one of the most popular official Plex channels. It allows you to easily access content from the BBC and watch live television content from all across the UK. With plenty of both new and archived shows, the BBC iPlayer is a great addition to Plex. Note: You will need a UK IP address to access this channel. Follow our guide to unlock the BBC iPlayer on Plex. Source: Flixed. The USTV Now channel on Plex. USTV Now is focused on streaming live US-based television. It features easy filtering and sorting options and a huge variety of content. While USTV Now is a perfectly legitimate channel, it’s not available on the official Plex store. You’ll have to use the Unsupported App Store to get this channel. Related: Plex What Is The Plex Unsupported App Store – And How Do I Install It On Plex? Source: Flixed. The RT channel on Plex. If you’re a cord-cutter who misses the daily news, the RT America Plex channel is a great choice. RT America provides a critical view on current affairs in American government. It broadcasts breaking news and discussions about American politics. The CBC official Plex channel provides a wide variety of streaming content. It features live sports streams, expertly-crafted documentaries and even radio programming. Note: You’ll need to use a VPN (recommended: IPVanish) to access CBC content if you’re outside of Canada. Source: Flixed. The PBS Plex channel. The PBS official Plex channel is a great source for informative, interesting video content. Through this channel you can browse programs offered by over 350 member TV stations, sort by the most popular videos and access live TV streams of PBS member stations. If you’re just getting started with Plex, we have plenty of other great resources you can use to learn about installing new channels, including guides, recommendations, and more. Check them out below, and you’re sure to be able to make the most out of this powerful home theater system.